Day 8: Rocky Camp to Anza. 20 miles. Are these things made of paper?! I packed up and sat on a rock, carefully and precisely pricking myself, occasionally successfully landing a good stitch. Convict came over, smiling. She likes when I have to sew my pants. It means she gets a bigger head start that day. 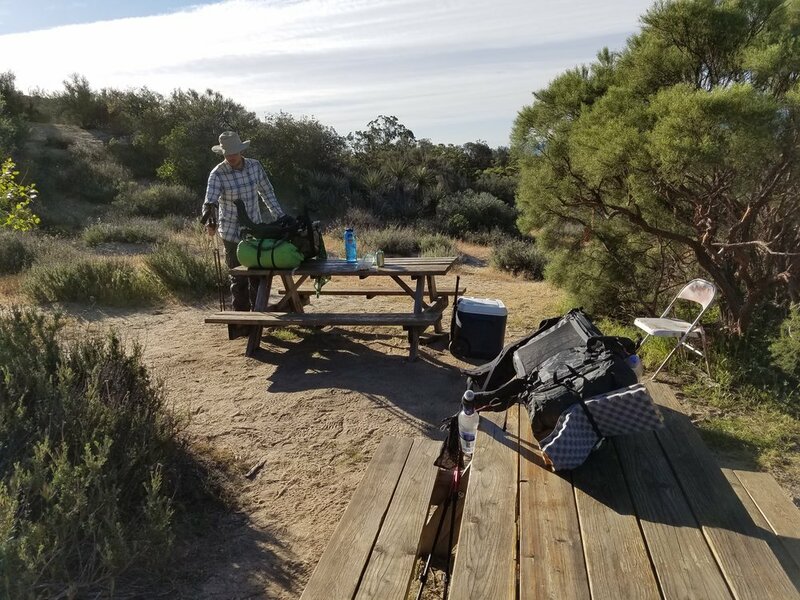 She took off toward Mike Herrera's place, a trail angel known for being an oasis in the middle of a long dry stretch of trail. Left alone with my sewing kit, I set my Inreach next to me, just in case. 'Has anyone ever had to be rescued due to sewing related injuries?' I asked myself. 'No, that's ridiculous,' I assured myself as I scooted the inReach closer. The pup's owner, Brad, came running along behind her, reassuring us that she was friendly. The dog's name was Lola. He was a fellow thru hiker and Lola had come with him the entire way so far! We were slightly sketched out by the appearance of the place, but before I even set foot within the compound, a big guy behind a grill yelled "Hello! You guys want pancakes?". Maybe this place is alright. He introduced himself as Scott, a long-time thru hiker who we learned had done the PCT several times over the years. This was the first real breakfast I'd had on trail, and I was hungry. Really hungry. Even if Lola had attacked me, I would've kept pushing my way towards potential pancakes. Scott loaded our plates with pancakes, eggs, and hashbrowns. He grabbed a couple of old mugs and poured us some amazing coffee from a beat-up, rusty kettle. I couldn't eat it fast enough. This place is definitely alright. We never met Mike, but after breakfast there was a fellow heating water in a large tub. He was about to strip down for bath time, so we figured it would be a solid time to hit the trail. I threw some money into a donation jar, checked out a room full of hiking odds and ends others had left behind, and headed off. Lola, also upset with my sewing job. What a unique, awesome spot to stop by. It kind of blows my mind that these trail angels are so welcoming of so many strangers. They're truly amazing people. Back on the trail, the miles were making me work. There were many loose rocks along the trail of impeccable ankle-breaking size. It was sunny and hot, forcing me to put on my sleeves and headwrap to protect from sunburn, but also making me sweat even more on this dry stretch. I passed 133 total miles, my previous furthest backpacking trip. I had taken 13 days to do that trip in the Sierra and I was only on day eight on the PCT. Although the Sierra is a tougher terrain to hike in. I passed so many wildflowers. The term "superbloom" is apt. Flowers have overgrown the trail in many parts. It's amazing. At one point I hadn't seen water in 15 miles, but there were flowers everywhere. How does that work?? I caught a glimpse of snowy San Jacinto, still far in the distance. A long uphill section in the sun had me going through much more water than I wanted to. I had started with four liters and realized I still had five miles to go to a seasonal stream (most of which had been flowing) with only one liter remaining. I slowed my pace and came up to a fragile cistern with green, stagnant water inside. My inner water snob appeared and I decided to pass, since the water source was only a mile ahead. I got to the water source very thirsty. Dry. It wasn't flowing. Uh-oh. There were roads ahead, I figured I would start hitching into town if I needed water still. There were more potential water sources ahead. Damn. That cistern water wasn't looking too bad now. I was ready to turn around and go apologize to the cistern a few miles back when a sign on the trail read 'water cache ahead'. I downed the rest of my water and charged down trail to a beautiful, stocked water cache next to a dirt road. I wish I could hug every person who's ever stocked one of these caches. A couple miles later, I set up camp once again among a group of boulders above the outskirts of Anza, longing for my climbing shoes. The winds had picked up heavily, so it was a fight to get the tent set up. Convict and Nico showed up shortly after. Both of them prefer cowboy camping out in the open. I must be on the high maintenance end of the backpacker spectrum. But seriously, what if an icky bug touches you while you're painting your nails? I rest my case. 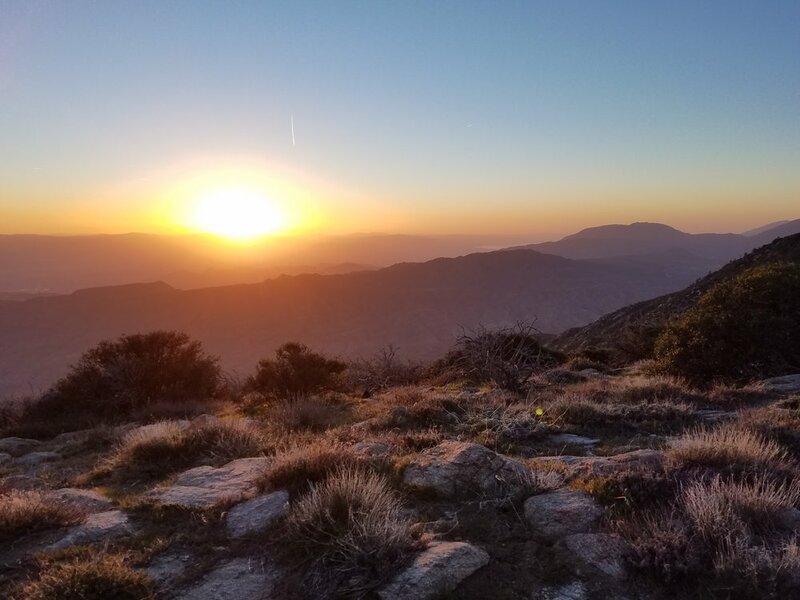 Day 9: Anza to Pyramid Peak. 20 miles. A depressing day in Paradise. I slept super hard from the tiring day before. Once again, I awoke and started my never-ending chore of sewing my pants. 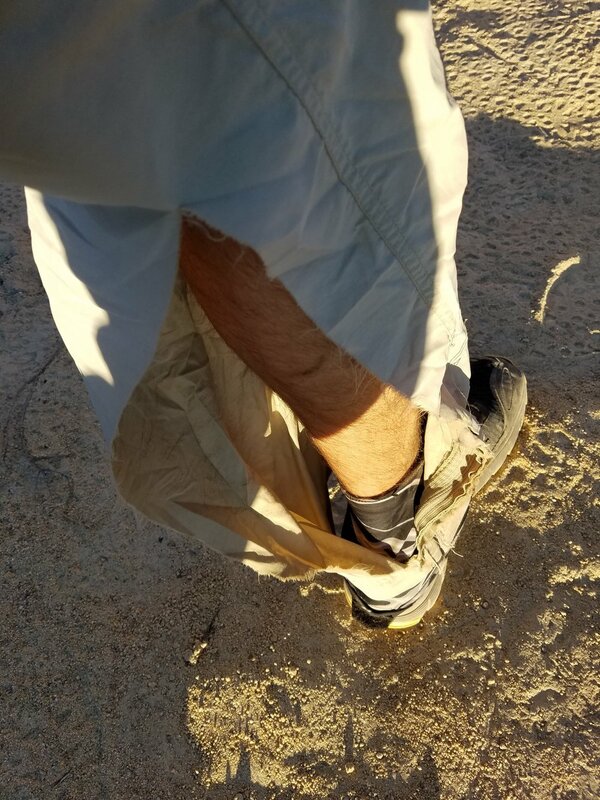 I didn't even know when it had happened, but another tear in my pant leg had opened up. Smiling Convict said goodbye and headed down the trail. 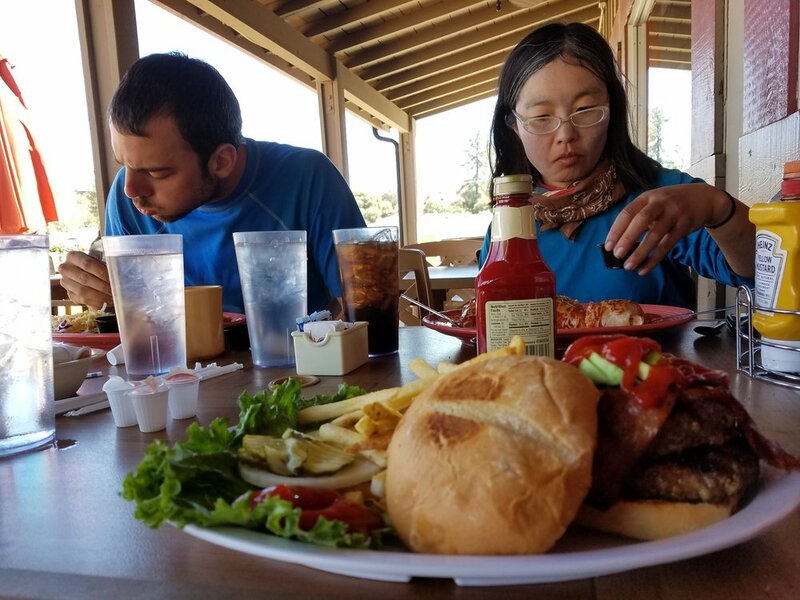 A quick, half-hearted stitch later, I set off for what I knew would be a long uphill day but with the much-anticipated Paradise Valley Cafe for lunch! Only a mile or two from camp was the Walden cache, which was... interesting. There were sodas, picnic tables, and a nice little library all behind a neighborhood that looked fairly affluent. All three of us were there, already feeling lazy. There were life-size, wood figures of Henry David Thoreau and quotes from Walden... which I found odd. Then down by a water tank there were road barriers warning PCT'rs that the neighbors would call the police if they saw hikers in the neighborhood.... also odd. They're right to be nervous around PCT'rs. We smell TERRIBLE. 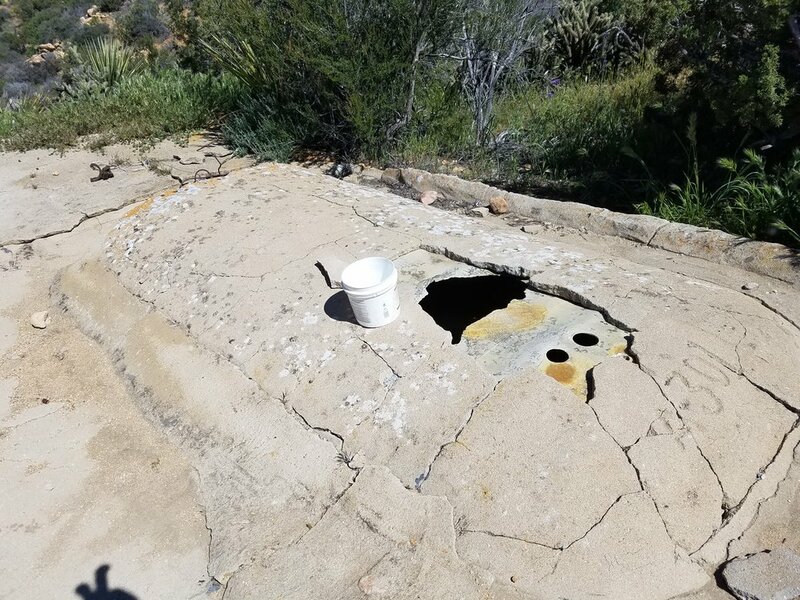 I'm sure the folks who stock this cache mean well, but it felt like the cache had been established to keep the hiker trash in the desert, where we belong! Wouldn't hurt if we got some kind of education too, right?? Of course, I'm kidding. I could see the water situation in that area driving PCT hikers into the neighborhoods constantly without the caches. The hikers definitely appreciate the water. But calling the police? Really? I mean, the most dangerous thing I have on me is my underwear. Ok, maybe call the police. About ten miles and several snakes later, we were at highway 74. Paradise Valley Cafe was a mile detour west, so we stuck our thumbs out, excited for the first hitchhike of the trip. A mile of depressing walking later, we were dejected, but looking forward to the prospect of cheeseburgers. They did not disappoint. Nico and Convict blacking out with happiness. Paradise Valley Cafe was incredible. 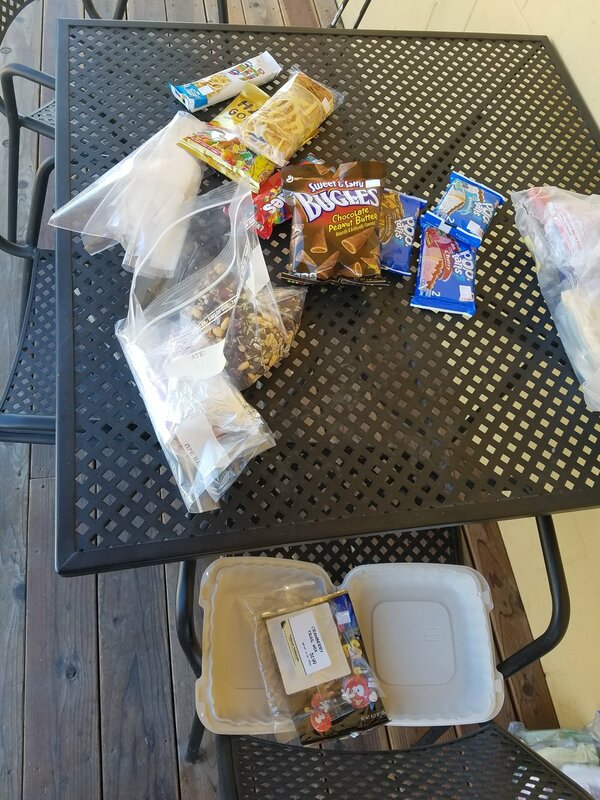 The staff were super friendly, they had outside seating for those of us who smelled, uh.... stronger than others, they filled our water for us, there were plugs for electronics, and there was even a hiker box FULL of really nice dehydrated meals from Cabellas. It looked like a resupply box from someone who had quit the trail already. I'd say I'm sorry they quit... but that would be a ridiculous lie. I ate like a king for days afterwards! Convict and Nico took off while I waited for my battery pack to charge. I sat down and talked to a fellow thru hiker, Dave from Ireland. Cracked lips and peeling skin attested to his story of losing his sun hat a few days ago. He had worked at a gas station for a long time to save up for this trip. Some people make some serious, long-term sacrifices to be out here. I wrapped up my stuff and thumb up, walked one more mile of shame back to the trail. I watched Dave zoom by me in a silver car. Dammit. "I'll take off my underwear!! They can ride in the trunk!! ", I shouted at passing vehicles. Didn't help. I started up the remaining 10 miles to camp. The rocky trail, uphill grade, and cheeseburgers were all fighting me. I eventually caught up to Lucky Dave (as he shall now be called) and as I felt better I passed a few more people heading up into the San Jacinto range. Finding camping was tough. The winds were whipping and every site seemed to be on an exposed ridge. Hiking along the windy ridge, trying to find a sheltered campsite. Once again, I was being Mr. High Maintenance with my tent, but I repeat: bugs are icky. We were higher in elevation, and it was chilly. I caught up to Nico and Convict and eventually we found a great spot on the ridge with a big grove of trees cutting the wind. We were overlooking Palm Springs and the vast desert east of San Jacinto. We watched the city illuminate from thousands of feet above as the sun set. Watching the sun set from near Pyramid Peak. Day 10: Pyramid Peak to South Ridge. 22 miles. I woke early, which was easy since we were so exposed to the sun's rise over the eastern horizon. Connect steps from Mexico to Canada. Hike every possible section of the trail. For today, that meant walking the full alternate. No skipping. No hitching. A goal shared by only me. Convict and Nico were planning on hitching to Idyllwild, some hikers had hitched all the way from Paradise Valley Cafe, skipping a beautiful 14 mile section of the trail. I'm not out here to not hike the PCT. So alone, I headed off. Attempting to move fast enough that I could catch Nico and Convict somewhere on San Jacinto. I was running low on food, so I pulled out a Snickers for breakfast, once again making my Mom cringe somewhere. The trail was very overgrown and hard to follow in places, it was obvious it hadn't been used much this year. I hiked to the edge of the closure at Fobes trail and headed steeply downhill toward the highway I'd eventually walk along. I reached the highway around 10 and started the road walk. At one point, two cars hurriedly pulled over a couple hundred yards ahead of me. Convict popped out! They had found their hitch! She asked me if I wanted to hop in, but I respectfully declined, a man on a stubborn mission. When I say I'm walking from Mexico to Canada, I mean it. A slight panic crept into my mind as they drove off, but in reality I was enjoying the walk. 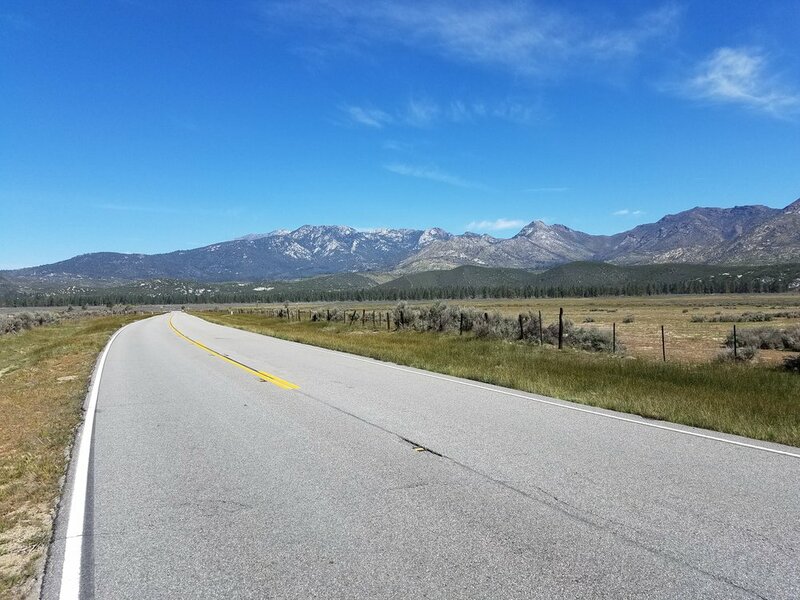 I had cell service and was able to call Melanie, which made the miles slide quickly by. The area was beautiful and before long I was at Hemet Lake Store. I hadn't heard of the Hemet Lake Store, but I decided to check it out. Good decision. There was a small deli where I immediately ordered a carnitas quesadilla, a gigantic wrap, and the biggest beer I could find. I was starving and my empty food bag wasn't helping. The employee gave me a judging eye and said "Both of those lunch items are pretty big". I know what I'm doing here, son. Both lunches were soon gone and I was relaxing on the sunny deck, enjoying a conversation with Todd, a friendly guy from Washington state. I still had miles to crank out, so after buying a ton of junk food and trail mix... and then mixing it all together... I cranked out some quick sink laundry in the bathroom and headed along the road. Cranking out my ridiculous trail mix of nuts, Skittles, gummy bears, Bugles, M&M's etc. Back along the road, it narrowed to the point where shoulders were narrow and kind of sketchy to walk down. I stubbornly pushed on. A truck came to an abrupt stop next to me, "You want a ride?". It was a familiar voice... Scott the cook from Mike Herrera's place?! What a coincidence! I declined again, proud of my conviction, but wishing the road portion would end so I could get dirt back under my feet. Finally, the forest road came up. After a dry stretch, the dirt road headed uphill through big meadows and a good water source. 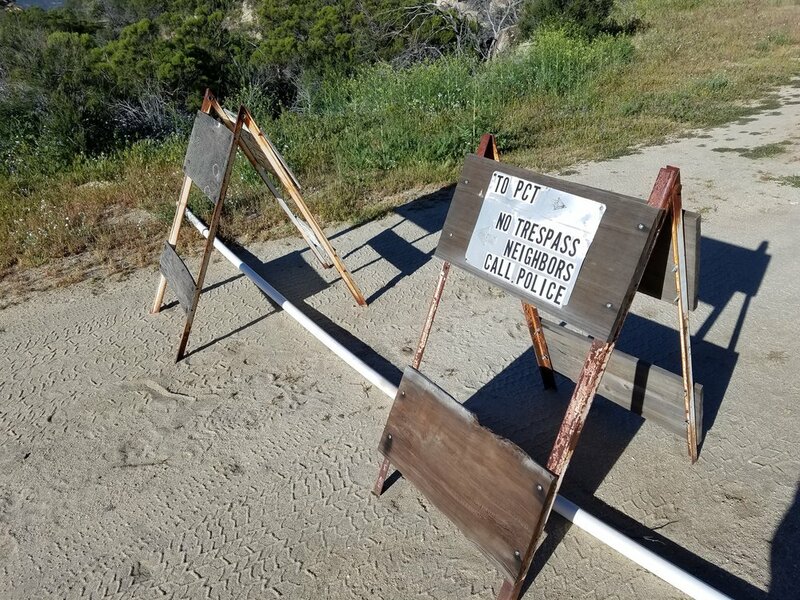 I was looking for a trail up to the South Ridge and found a sign theoretically pointing to the trail... but there wasn't a trail. Just bushes. After swearing my way through some bushes, I found a faint trail headed in the right direction. At a few points, I wasn't entirely sure I was on a trail, but I pushed on. I knew I had to walk uphill, so I'd just keep doing that. I'd eventually gain the ridge. The trail improved as I ascended and after a few steep miles I arrived at a road with a truck and... boulders! With chalk on them! My climber heart got excited and I worked out some beta in my mind, longing for climbing shoes once again. 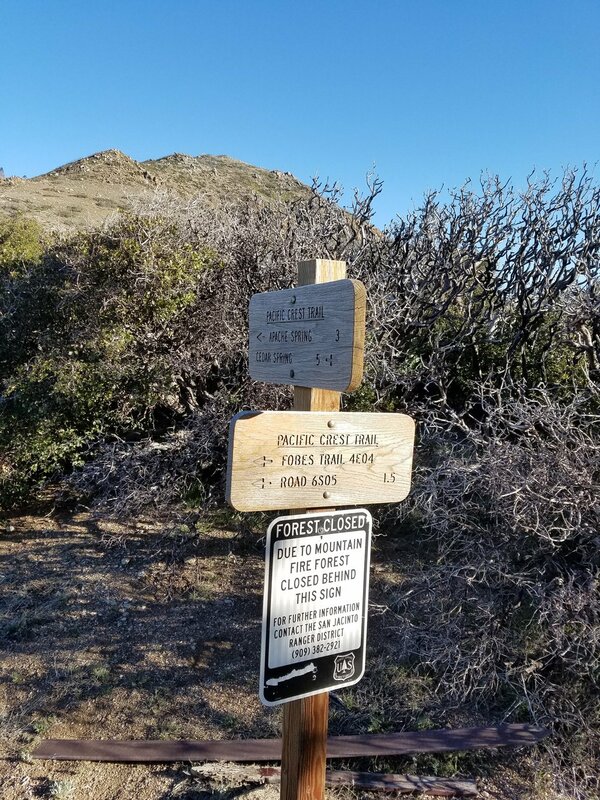 I headed up the trail toward Taquitz Peak, but a sign was posted that made me stall out. 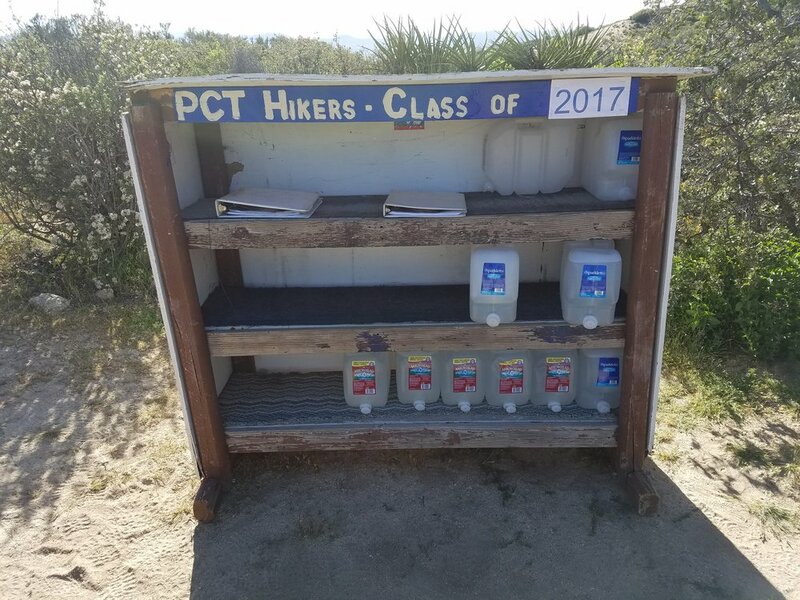 A very adamant warning that the PCT would be dangerous to reach from this path without full winter gear was posted. I only had microspikes, so I was hesitating at the sign, considering my options when I heard someone walking down the trail toward me. It was Kenny, the owner of the truck in the lot. I asked him about the snow and he was telling me he hadn't seen much up there, so I made the decision I'd go for it. The climber in me was hungry for a greater challenge than simply hiking. I could always turn around, right? Then Kenny offered to make me some food, a surefire way to stop a thru hiker's forward progress. Trail angel, Kenny, whipping up some chipotle rice for us. 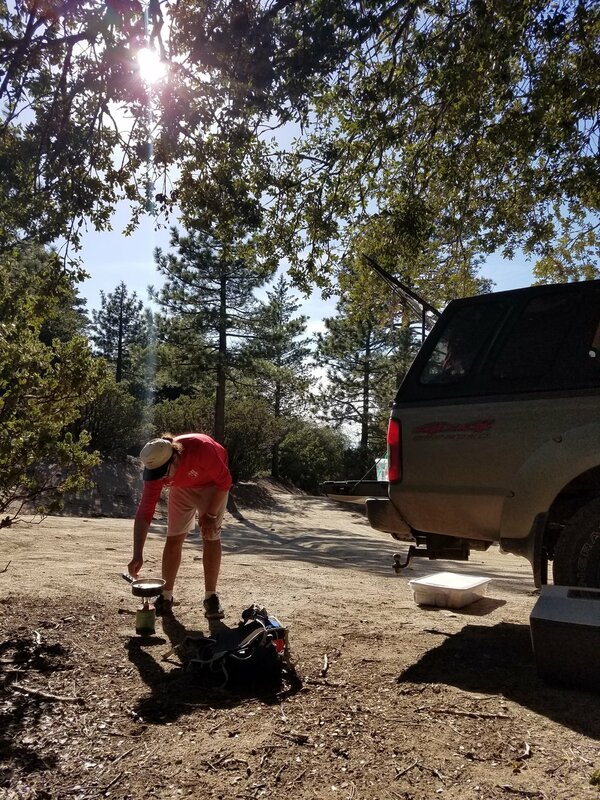 I decided to camp there among the chalky boulders just outside Idyllwild, talking with Kenny and enjoying my first true trail angel experience. Kenny was in his early 20's and was from Maine. He was on a big road trip before heading home and then heading off to Prague to teach English! What a great guy. He whipped up some chipotle rice and I pulled out some pecan rolls to share for dessert. I crawled into my tent, exhausted after a long day of holding myself to my convictions. I awoke suddenly, maybe a half hour after falling asleep, and there was a light... a still, bright headlight right outside my tent. Slightly creeped out, I nervously asked who they were. It was Nico! He'd decided to go up Taquitz Peak as well, after picking up snow gear from Idyllwild. I fell back asleep, comforted there would be another person to tackle tomorrow's snow with. But I'm buying that guy a bell or something.